1. On a pan, toast flour in moderate heat for about 15 minutes, or until light brown, stirring constantly to avoid burning. 2. Remove the pan and transfer the mixture into a big bowl. 3. Add the powdered milk, and toss for another 3-4 minutes. 4. Add sugar and melted butter. Mix well. 5. Fill the polvoron mould with the mixture, press it hard by using a spoon, then release it. If it is still too loose, add more butter or olive oil. Make sure that you could pick up the polvoron without it crumbling straight away. 6. Place the polvoron in an airtight container, then chill in the fridge until firm. 7. Carefully wrap the polvoron individually in japanese paper or cellophane. 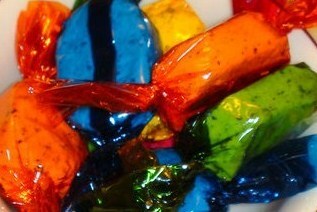 To try Negros’ Best polvoron, please come to the 26 NEGROS TRADE FAIR ON September 28, 2011 at Rockwell Tent, Makati City.